Holden A. Whaley, 29, Washington C.H. (seated left), appeared for a final pretrial on charges of aggravated trafficking drugs, fourth degree felony, aggravated possession of drugs, fifth degree felony. According to the state, discovery is complete. Whaley’s defense attorney, Thomas Arrington (seated right) said reciprocal discovery is due from the defense by March 30 and requested more time ahead of trial. The final pretrial was continued to May 9. · Keenan D. Lee, 26, Dayton, appeared for a final pretrial on aggravated possession of drugs, methamphetamine, and a minor misdemeanor possession charge. Lee’s defense attorney, Thomas Arrington, requested additional time to discuss the case with Lee. The final pretrial hearing was continued to April 16. Trial is set for May 10. · Mikka D. Winters, 27, Washington C.H., was scheduled for arraignment on a fifth degree felony charge of receiving stolen property. Winters was notified by summons served by the Washington Police Department, according to statements made in court. Winters is charged with receiving stolen property in an incident that was said to have occurred Jan. 31. Winters did not appear. Bond was revoked and a warrant was issued. · Jeffery J. Dunaway, 27, Washington C.H., appeared on a charge of trafficking in marijuana, a felony of the fifth degree. A final pretrial is set for April 16. Trial is scheduled May 9. Dunaway’s attorney is Kristina Oesterle. Oesterle said she received discovery March 12 and gave a copy to her client at the court hearing, and plans to meet with her client April 2 to review the discovery information. · James E. Blackburn, 27, Washington C.H., appeared for sentencing on a charge of aggravated possession of drugs, a fifth degree felony. Blackburn plead guilty to the charge in December. Judge Beathard requested that Blackburn be drug screened by the Fayette County Adult Probation Department prior to sentencing on the charge. Following the result of the drug screen, the court said Blackburn was positive for methamphetamine and opiates. Blackburn previously failed to appear for a pre-sentence investigation with the Fayette County Adult Probation Department, according to reports. Fayette County Prosecutor Jess Weade said the state believes the case is a mandatory community control case. Blackburn’s bond was revoked and the judge ordered that he be held until sentencing at another time. Beathard said Blackburn has a “raging drug habit” and that he may need to go to inpatient treatment. Beathard ordered a pre-sentence investigation to be completed. · Shayne Ace Detweiler, 29, Washington C.H., is incarcerated in the Tri County Jail for a robbery charge out of Madison County, but was scheduled for a final pretrial hearing, according to the court. In Fayette County he is now charged with theft and illegal use of SNAP or WIC benefits. The final pretrial hearing was continued to June 11. · Holden A. Whaley, 29, Washington C.H., appeared for a final pretrial on charges of aggravated trafficking drugs, a fourth degree felony, aggravated possession of drugs, a fifth degree felony. According to the state, discovery is complete. Whaley’s public defense attorney, Thomas Arrington, said reciprocal discovery is due from the defense by March 30 and requested more time ahead of trial. The final pretrial was continued to May 9. According to comments made to the court Monday, Fayette County Assistant Prosecutor John Scott said the state made Whaley an offer on the charges, the offer was rejected and a counteroffer was made. Bond was reduced. · Cody A. Gabbert, 30, Jeffersonville, appeared for a final pretrial on charges of possession of methamphetamine and fentanyl. Gabbert’s public defense attorney Kristina Oesterle said she had just received discovery last week in the case and gave it to her client at that day’s hearing, and requested more time to review the information. The final pretrial was moved to April 16. Trial is scheduled for May 3. · Brian L. Moore, 36, Washington C.H., plead guilty to aggravated possession of drugs (methamphetamine) in the amount of .02 grams, a fifth degree felony. According to reports, the Washington C.H. Police Department stopped Moore Aug. 28 for running a stop sign. The white powdery drug was found in a small baggy in the driver’s seat after K-9 ‘Dexi’ was brought to check the vehicle. A pre-sentence investigation was ordered and sentencing was set for May 14. · Jamie S. Bowles, 36, Washington C.H., appeared for a final pretrial hearing Monday on a charge of violating a protection order, a fifth degree felony. Bowles was arraigned Feb. 26. According to the court, Bowles was under a mandatory supervision period of three years post-release control (PRC) with the Adult Parole Authority (APA) when the alleged violation occurred. Beathard said the decision remains with the parole officer whether or not he can go back to prison for up to nine months for the parole violation. For the charge of violating a protection order, Bowles faces a maximum sentence of one year in prison. Beathard said it sounds like the case will be resolved before its scheduled jury trial in April and said the court will contact the APA to see how much time Bowles had remaining on his PRC. The amount of time remaining may be added to enhance the sentencing charge on the new violation. · Joshua N. Hudson, 41, London, appeared on three criminal cases on charges of grand theft of a motor vehicle, a fourth degree felony; theft, a fifth degree felony; and receiving stolen property, a felony of the fifth degree. During the hearing, it was discussed that upon a motion the court will consider joining the cases for trial. Discovery was said to be complete from the state. Hudson’s public defense attorney, Thomas Arrington, asked to vacate April’s trial date and asked for more time to file reciprocal discovery and to prepare for trial. Hudson is currently serving a seven-month prison sentence for theft out of Fayette County and is incarcerated at London Correctional Institution. Hudson will be released from prison on that offense May 15 and will have to return to the Fayette County Court of Common Pleas June 11 for a final pretrial on the three cases. Fayette County Assistant Prosecutor Sean Abbott said the state made a sentencing offer on the charges to the defense. At this time, the defense rejected the state’s offer. Abbott said the state would leave the offer open until May 29. Hudson signed own recognizance bonds. · Michael A. Newsome, 47, Washington C.H., appeared for a final pretrial on a charge of theft. Newsome’s attorney Kristina Oesterle said in court that she mailed discovery to her client but that her client never received it, and stated she gave discovery to her client when she saw him before the court hearing. More time was granted and a final pretrial was scheduled for June 11. Trial is scheduled for June 14. 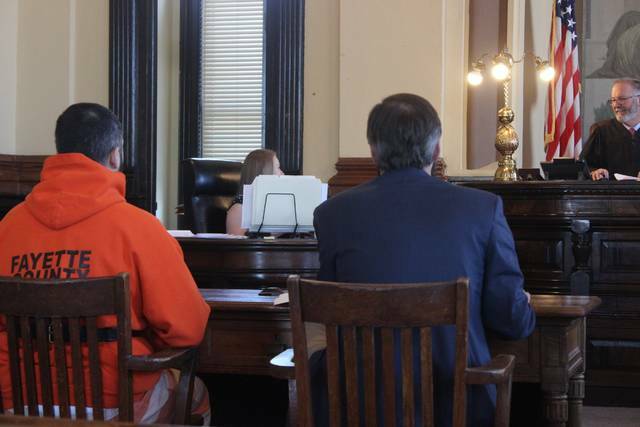 · Sarah H. Daniels, 55, Washington C.H., appeared at a final pretrial hearing on two cases, both charging one count of aggravated possession of drugs, fentanyl, each a felony of the fifth degree. The possession charges occurred Sept. 30 and Feb. 16, according to court statements. Daniels’ public defense attorney, Thomas Arrington, requested discovery and a copy of the indictment for the most recent charge that was said to have occurred in February. Arrington asked for an additional 30 days to review discovery. A final pretrial hearing was scheduled for April 16. Jury trial was set for June 12.
https://www.recordherald.com/wp-content/uploads/sites/27/2018/03/web1_CourtHearings.jpgHolden A. Whaley, 29, Washington C.H. (seated left), appeared for a final pretrial on charges of aggravated trafficking drugs, fourth degree felony, aggravated possession of drugs, fifth degree felony. According to the state, discovery is complete. Whaley’s defense attorney, Thomas Arrington (seated right) said reciprocal discovery is due from the defense by March 30 and requested more time ahead of trial. The final pretrial was continued to May 9. Contact Ashley at (740) 313-0355 or connect on Twitter by searching Twitter.com for @ashbunton and sending a message.